Having an already huge baby bump can be somewhat limiting when it comes to movement and wardrobe choices. But that will never mean that you can’t enjoy costume parties and Halloween. 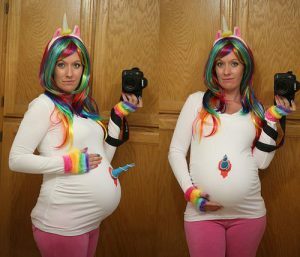 If you might think that being pregnant will prevent you from wearing fun and fab costumes, well you thought wrong mommies! 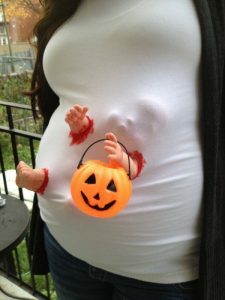 When your belly is already up front, why not use it as a part of your costume right? 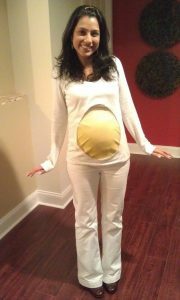 In this post, we will be showing a range of creative maternity costumes that will boost your imagination and more fun. We have included a few DIYs and even those you can buy online to include in your maternity costumes choices. 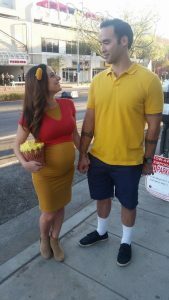 Thi maternity costume is super easy to create and make. You can get a bigger white shirt or dress, cut it along the outline your baby bump and wear it over a yellow tank top. And voila! You will now look like a freshly cooked sunny-side up breakfast egg. Not only that this is a super comfy costume, it is also super easy to make with cheap materials. This costume is super easy to find. 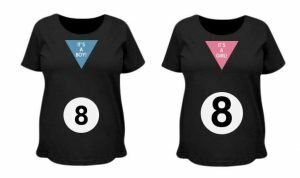 You can even choose between the “It’s a Boy” and “It’s a Girl” print. Moms love that these shirts are super comfy with ruched side seams that are perfect for stretching bellies. The shirt is made from 100% combed ring-spun cotton jersey. It is breathable, lightweight and super stretchy. Despite the very simple and easy design, this costume is really fun and trendy with a stylish design that moms will love. Plus, your growing baby bump will serve as the perfect shape for the Magic 8 ball. This is a super fun twist on the traditional skeleton costume and make-up. This one will include your little baby who is still inside your tummy. 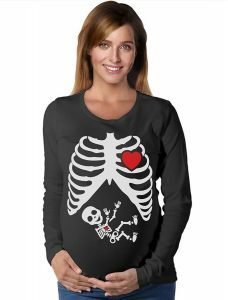 This cute long longsleeved shirt features a little skeleton who appears to be inside your belly. You can even get a skeleton shirt for daddy with either food or beer designed in the tummy. This will be perfectly paired with black jeans or leggings. You can also add skeleton inspired make-up effect on your face, using a skull face painting kit or use a mask and incorporate skeleton gloves, for a total package. Making this costume can become a bonding time for you, your hubby, or your older kids. This costume is also a good way to exercise your creativity and artistic side. Aside from being so inexpensive, they are also super easy to make. Simply cut large pieces of cardboard to your desired size and shape it like a huge avocado and paint it in green shades. 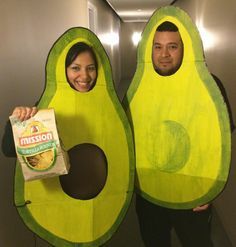 You can wear a brown top underneath the cardboard costume so that your growing belly can become the avocado pit. 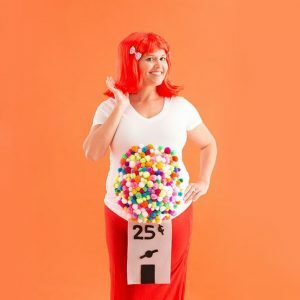 This is a super cute and colorful costume for all the preggy moms out there. Although this costume might require more work during the preparation, you will totally love the finished costume. You will just need a few materials that you might already have such as a red beret or any red hat, white top, colorful mini pompoms, and a red skirt. 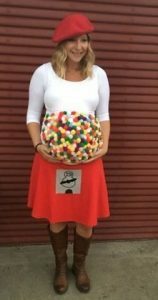 Your baby bump will become the perfect carrier for the little colorful pompoms as gumballs. Just glue the mini pompoms on the tummy area of your shirt, create a coin slot using a cardboard or paper and glue it the skirt. And then you are good to go! Be ready to be the most adorable gumball machine in the party, mommy. Troll Dolls are plastic dolls with messy combed-up hair portraying trolls, also referred to as Dam dolls because of a Danish woodcutter named Thomas Dam who created the first troll doll. These tiny dolls are also called good luck trolls, or also as gonk trolls in the UK. 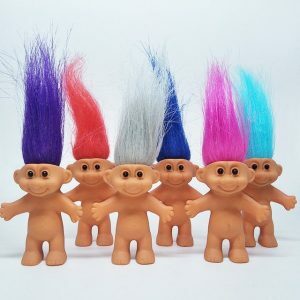 Those original troll dolls were naked with a quite large and cute tummy. That is why mommies with their baby bump will be able to wonderfully recreate these troll dolls in a super cute way. This costume is also super easy to create! You will just need a skintone or beige colored dress and a troll wig in the color you like. A good pair of beige shoes also will give the illusion that you are going barefoot, just like the true trolls! You could probably still remember Miley’s infamous music video for her song, Wrecking Ball right? 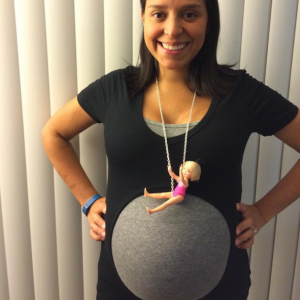 This costume is some comes with a super hilarious and fun pop culture reference with your baby bump as the perfect wrecking ball prop. The costume is also super easy to create. You just need a blonde doll, small silver chain as a necklace, black shirt, and a gray tank top. The first thing that you have to do is to cut out a hole in your black shirt so that your baby bump can come through and become the cute little wrecking ball. Don’t forget to wear the grey tank top underneath. You can glue the doll into the silver chain necklace and let her sit on the top of your growing baby bump. Super creative, hilarious, and easy all at the same time! 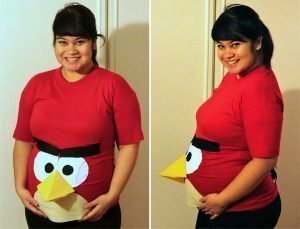 The red angry bird, because of his round shape, will be the best fit for your baby bump’s shape. You can easily recreate this character by simply wearing a red dress and putting on Red’s face over your baby bump. Simply cut out the eyes, eyebrows, beak, and other details and sew or glue them on to your red dress. Use your creativity and take out your art materials for this costume, and you’ll surely have some fun! Mike Wazowski and Sullivan from Monsters Inc. 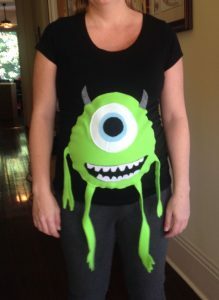 If you love the movie, Monsters Inc. you’d be delighted to know that you can creatively dress your baby bumps as Mike. A round belly makes for a perfect Mike Wazowski! You can wonderfully assemble this costume just by using a black shirt, lime acrylic felt fabric, plus your creativity. Draw on Mike Wazowski on the felt fabric, cut him out, and sew or glue him on the black shirt with his hands and legs hanging. 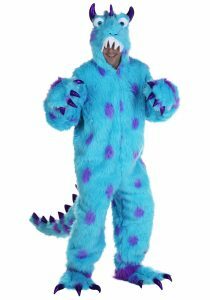 For a cute couple match, you can let your husband wear a Sullivan costume. This costume is also a great idea to get your husband involved. 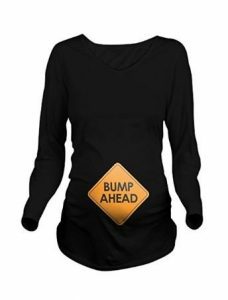 The “Bump Ahead” road sign incorporated into your pregnancy and baby bump is very witty and super easy as well, simply because you got a bump too. 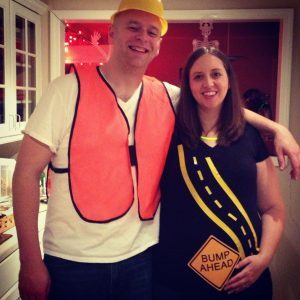 You can just wear a shirt with a “BUMP AHEAD” sign and let your partner wear an industrial safety vest and a hard hat. You will then be both good to go! Winnie the Pooh is one of the most famous characters in costume parties. Not just because he is an adorable bear but he is also easy to recreate. Winnie also has a noticeable big tummy that is why preggy moms look really cute as Winnie the Pooh. Another nice thing about going as Winnie the Pooh and Christoper Robin is that you will be able to use the clothes even on normal days cause they are just practically casual clothing. As Winnie the Pooh, you can just wear a red crop top blouse over a yellow dress, a Pooh headband will be cute too! Your husband can just wear a plain yellow polo shirt and casual blue shorts, and he will be good to go as Christopher. A costume that is super easy and super cute too! If you haven’t heard about Juno, it is an award-winning comedy-drama film that revolves around Juno who got pregnant during her teenage years. The movie received acclaim from critics, many of whom placed the film on their top ten lists for the year. It has received criticism and praise from members of both the pro-life and pro-choice communities regarding its treatment of abortion. 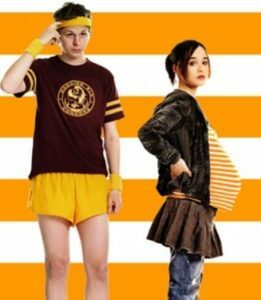 And because of its a relevant theme, Juno and Paulie constantly become an inspiration for couple maternity costumes. The characters’ looks are not only comfy and fun but also both of them are super easy to achieve. A complete set of Paulie’s track wear and Juno’s shirt is available on Amazon. Juno’s jacket, pants, and skirt can be found, for sure, inside your closet so you don’t have to spend more. 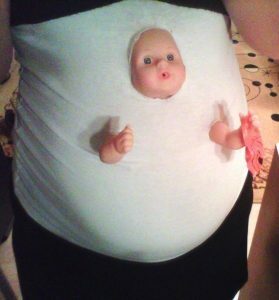 This maternity costume is a bit creepy and spooky. It is also very simple as well, all you need is an old white shirt and a doll to complete the look! If you want it to look more scary and Halloween-y, you can add fake blood to your shirt using red food coloring or ketchup. This costume basically looks like a pregnant unicorn carrying her baby with the tiny horn poking mom’s belly. It may look creepy but cute at the same time because of the rainbow accents, rainbow hair and cute unicorn horns. You can achieve this look by simply wearing a rainbow wig, unicorn headband, and attaching a smaller unicorn horn with fake blood on the top belly area of your shirt. Glittery makeup will also work very well with this costume. The traditional pumpkins will never be absent during Halloween costume parties, right? 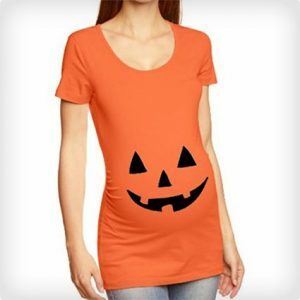 If you want to wear a low-key creepy costume without much effort, you can choose a printed shirt with a creepy pumpkin face on the belly area. Wear this shirt with black leggings and then you’ll be a creepy walking Jack-O-Lantern of the party. Enjoy the costume parties, mommy! 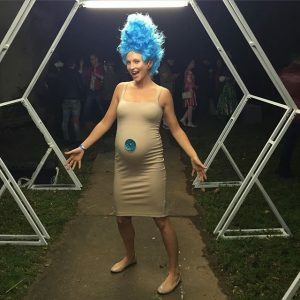 Being pregnant does not mean that you can’t go to costume and Halloween parties. 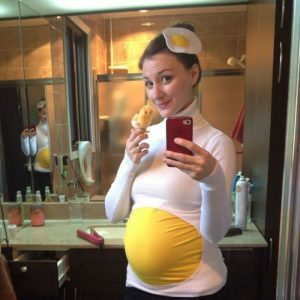 You can still enjoy that while wearing fun and fab costumes that will proudly feature your baby bump! 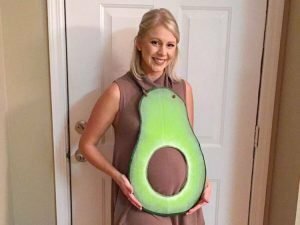 Hopefully, you have chosen a costume or two from this post that will best suit you and your growing baby bump.